The RAM ProMaster City was made with transporting large and heavy loads of cargo in mind. There are two available body-styles which offer different capabilities for different purposes. One version helps transport people and cargo while the other is all about transporting large loads and removes the second row of seats to maximize the space. There are many standard features included with the ProMaster City and many additional features available. The 2.4-liter Four-cylinder engine is standard on every RAM ProMaster City and is capable of generating 178 horsepower and 174 pound feet of torque. The nine-speed automatic transmission comes standard with the ProMaster City. The front-wheel drive system allows for a lower rear floor making loading and loading easier and increasing cargo space. The ProMaster City gets an estimated 24 MPG. When properly equipped, this minivan can tow 2,000 pounds and offers a payload of up to 1883 pounds. The ProMaster City offers multiple body styles depending on what the owner is needs the vehicle to do. The ProMaster City Wagon is great for groups of people who need to transport a lot of heavy cargo or equipment. It features five seats and plenty of cargo space. This is a great option for a band or anyone who is regularly transporting people and stuff. 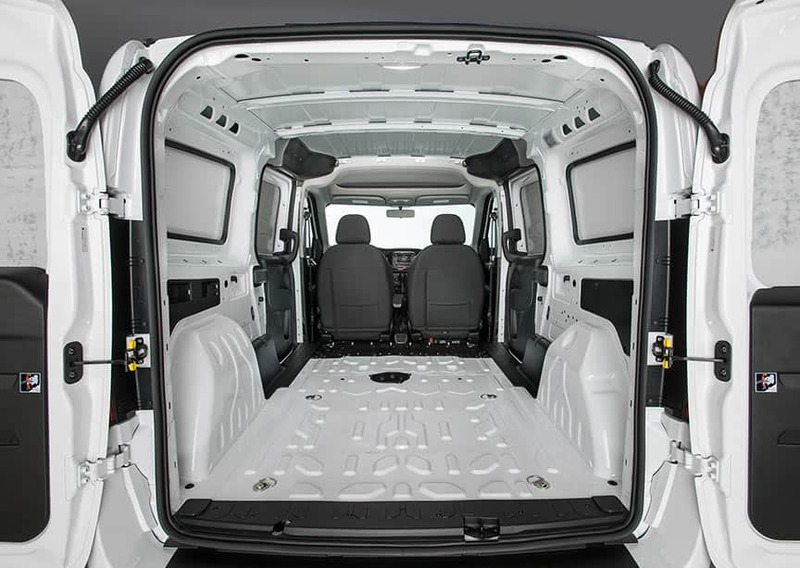 The ProMaster City Cargo offers even more cargo capacity by removing the rear row of seats. This version is great for commercial use and features best-in-class cargo volume of 131.7 cubic feet. A payload of 1883 pounds will help the driver move a lot of heavy cargo. There are two trim levels offering further opportunities for added features. The starting trim offers either version of the vehicle with cloth upholstery, a front overhead storage bin, air-conditioning, a four-speaker stereo, and keyless entry. 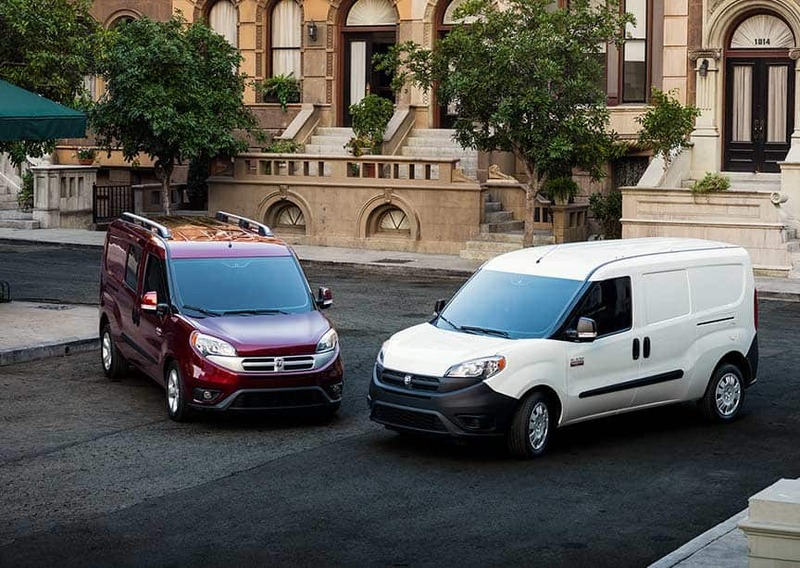 At the higher trim level, the RAM ProMaster City sees upgraded materials and features. This includes privacy glass, a Uconnect 5-inch touchscreen interface, upgraded cloth upholstery, heated mirrors, a leather-wrapped steering wheel, and an auto dimming rearview mirror. There are plenty of optional packages as well to help fill out the features list. Remote start, a navigation system, and cargo partitions are included in the Rear Back-Up Camera group, while the Popular Entertainment package offers a six-speaker audio system and heated front seats. Can I see the vehicles you have in stock online? What engines are available to power the RAM ProMaster City? Every 2017 Ram ProMaster City is powered by a 2.4-liter four-cylinder engine. 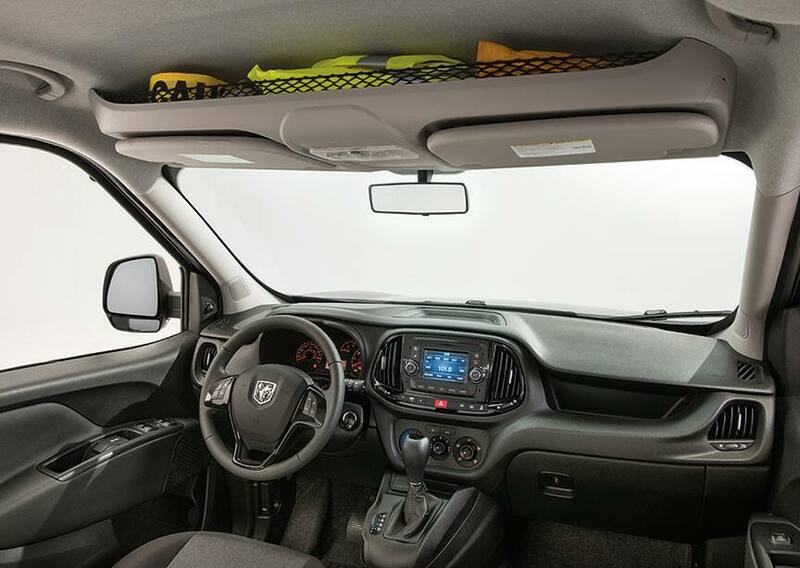 There are many available and standard safety features for the RAM ProMaster City. Side curtain airbags, front-seat airbags, driver knee airbags, trailer sway control with rollover mitigation, and traction and stability control are all standard safety features. There are also some advanced safety features that are available as additional equipment. For example, a rearview camera and a rear parking sensor are available advanced safety features and help to make parking in difficult areas less worrisome. The ProMaster City is ideal for bands who need to transport lots of people and equipment or businesses that need to move heavy cargo.